Description Here's a game for people who LOVE upgrade systems. 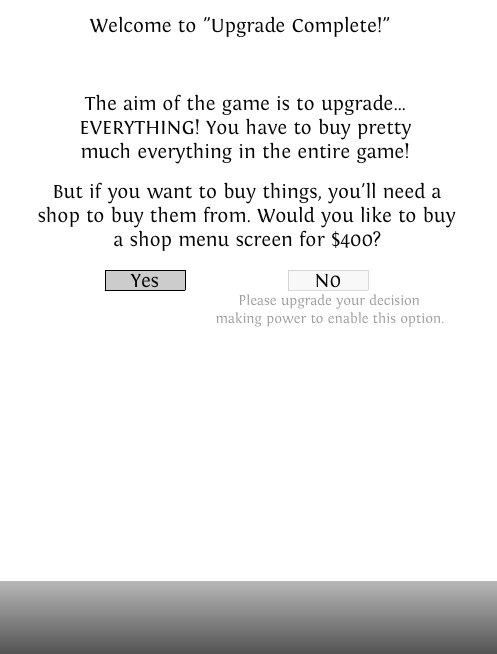 Nearly EVERYTHING in the game can be upgraded, including Menu Buttons, Game Graphics, and loads more! You even have to buy your own mute button! Absurd! How fast can you upgrade EVERYTHING? Controls Arrow Keys or A and D to move in game, Space to fire. Mouse to traverse menu/build ship.